Proposed Venice Beach Zip-line Details - Yo! Venice! The launch tower will be 16 feet wide and 50 feet high, with the takeoff platform 44 feet above the ground. It will be placed on the northern edge of Windward plaza across the boardwalk from Sidewalk Café. The final placement of towers and zipline will be determined by parks and rec to avoid conflicts with other event scheduled in the park during the summer. 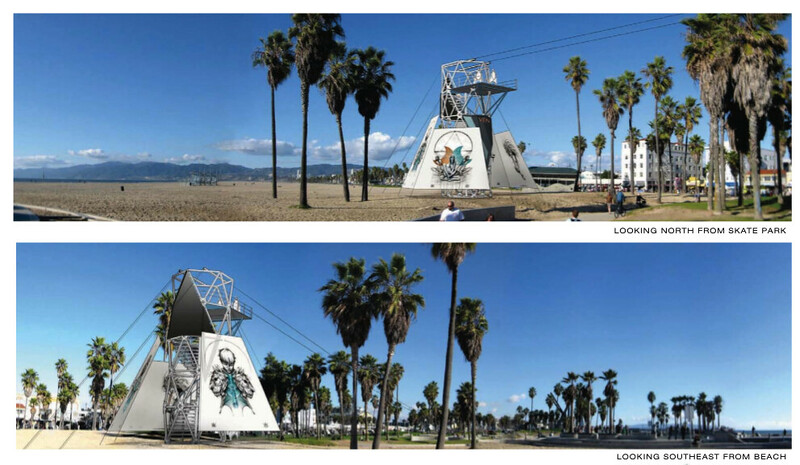 There will be 2-4 actual Zip Lines depending on spacing. Rides will cost a base rate of $20 per person. The VNC suggested discounts for locals and families, which organizers said would be possible Ian Green said that they were considering discounts to those who use public transportation and was open to discounts for riders who use their bikes to get to the attraction. There will be security and security lighting at night, but neither the tower or Zipline will be lighted except for special performances. from the CCC to install the Zipline on a long term basis. GreenHeart has pledged to offer one day per month to generate proceeds for local foundation(s) or NPO(s). They have a strong record of working with charity organizations. 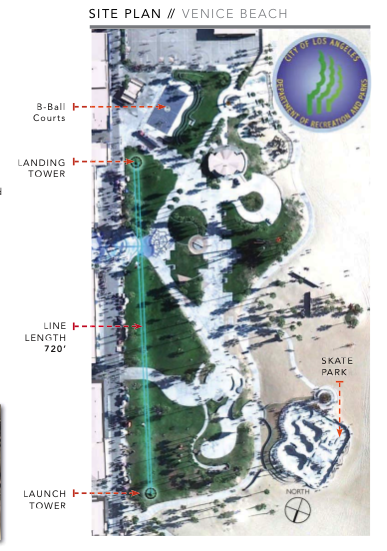 Kevin assured the VNC that the revenue to Parks and Rec from the Zipline would be ADDED to the Ocean Front Walk Park budget – no money already allocated to Ocean Front Walk area will be taken out. And he said that details of the deal would become public if permits are issued (because they would be public documents). Ian Green said that GreenHeart’s Zipline at Freemont Street in Las Vegas records an average of 400 riders per day – at $20 per ride, that’s an average $8000 per day in gross revenue. Additional revenues for the Venice location would be generated by the instructional classes offered to kids on an income based sliding scale (no estimate of that income was provided). With regard to Greenhearts’s Zipline in Bootleg Park outside Las Vegas, Ian Green said that they pay $30,000 per month to rent the park.